Compositech manufactures two lines of horizontal belt filters specifically for sand and silica processing. These filters have a limited water requirement and a very dry output. 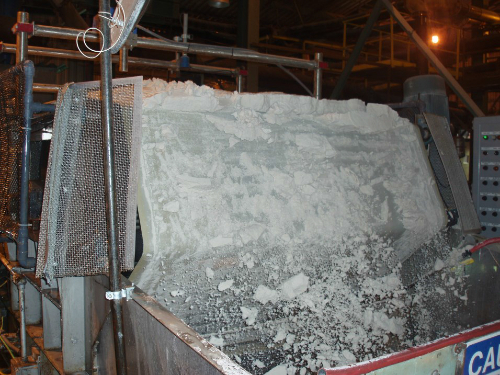 Our 5000 series and 4000 series horizontal belt filters (HBF) are the ideal equipment for high volume silica processing as they utilize both gravity and vacuum forces for rapid separation of liquids from the coarse solids. 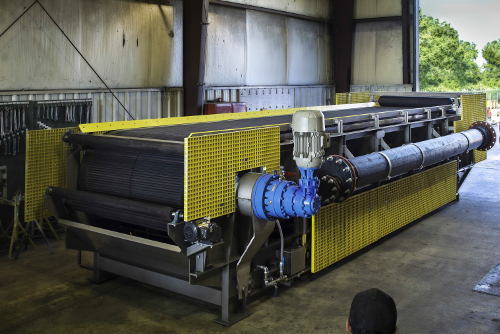 Compositech’s HBF is capable of washing soluble substances from the filter cake reducing residual moisture to very low levels in the dry zone. All components used in our 5000 and 4000 series HBF are heavy duty designed for continuous operation. The materials of manufacture in direct contact with the slurry, filtrate, or cake are 304L or 316L stainless steel, SBR/PBD elastomer, UHMW-PE, or HDPE thermoplastic. The remaining non-contact materials are 304 stainless steel or coated carbon steel and all fasteners are 316 stainless steel. The frame for our 5000 and 4000 series consists of two stainless steel main frames. These are composed of formed stainless steel channel legs and formed stainless steel cross supports welded between the main frames. The drive torque mount is also stainless steel as well as the drive bearing frame, belt take-up frames and media take-up frames. Our cloth and drainage belt wash collection pans are all constructed of 304L stainless steel. We supply our filters with full coverage stainless steel underfloor drain pans to collect all slurry spillage, wash water, and lubrication water and divert it through drains in the floor eliminating the need for a containment basin under the filter. Compositech is known industry wide for manufacturing the highest quality horizontal belt filter drainage belts available. Using high quality materials, design, and manufacturing best-practices, our drainage belts are produced with optimal physical properties. Each belt we manufacture is made of heavy-duty conveyor belt textiles with a 12:1 safety ratio using our proprietary elastomer formulation. Far superior to “off the shelf” belting, Compositech’s elastomer compounds are designed for drainage belt applications and are modified to meet our customer’s specific chemical, thermal, and abrasive requirements. Our drainage belts are manufactured with molded high capacity drainage channels and slotted drainage holes which improve the hydraulic capacity of the filter. Our belts are spliced endless with all fabric totally encapsulated with elastomer. 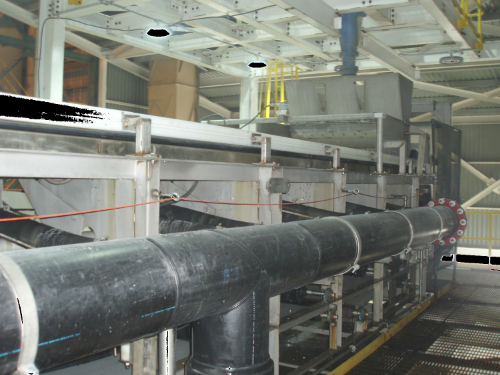 Our rubber covered steel rollers provide support to the drainage belt on the underside of the filter as it transverses the filter. Our drainage belt support rollers are manufactured of 316 stainless steel shafts and are rubber coated. Similarly, our cloth support rollers are plastic covered stainless steel rollers used to support the cloth belt as it transverses the filter. We mount all of our support rollers in high performance polymer bearings for smooth operation. Compositech’s sand filters are all equipped with a vacuum pan and wear belt system. The pan is fully rubber lined, assembled with 316L fasteners, and mounted on a cantilever vacuum pan lowering system for easy slide strip maintenance. Our Tri-Wrap wear belts are easily accessed when the vacuum pan is lowered. These replaceable wear belts drastically extend the life of the drainage belt.